Religious Studies has been thrust into the limelight of The Independent School system in New Zealand (ISNZ), with the recent double award to Catherine Syms, Religious Studies Director at Diocesan School for Girls in Auckland. 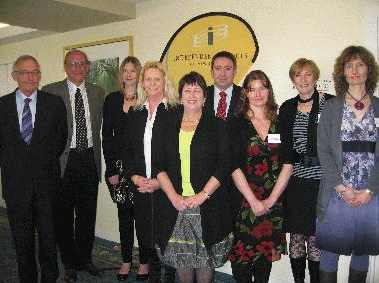 In April 2010, Catherine was awarded a one year research scholarship from the Heads of Independent Schools Trust which will allow her to pursue a study proposal to investigate approaches into improving the quality and delivery of an effective RS and Values programme within the independent schools. There is no state provision for professional RS teacher training in New Zealand, nor is there currently a unified and focused RS training module in the Anglican and Presbyterian theological training colleges. This study is primarily aimed at the provision of support for potential Chaplains within Anglican schools, but will take in a wider assessment of other candidates who might be considering an RS teaching career. The study will conclude with a presentation to the 2011 Independent Schools Conference, which will provide a significant opportunity to promote the subject across the sector as a whole – in both Church and non-aligned schools. Following quickly on the heels of this research award, and on the basis of a separate nation-wide assessment process, in July Catherine was awarded the 2010 University of Distinction/ISNZ Excellence in Teaching Award for Exceptional Professional Performance for years 7-10. The Awards Ceremony was held at the 2010 ISNZ conference in Queenstown in August and Catherine’s award presented by the NZ Minister of Education. Congratulations Catherine! Another great platform from which to promote RS and Values Education and to stimulate Principals into reflecting on the importance of our subject.